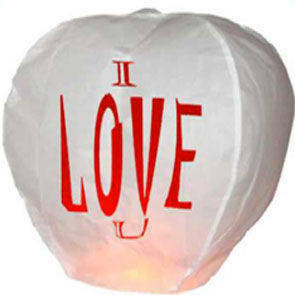 Wish Lantern White with red print "HEART" measuring 105x60 cm. 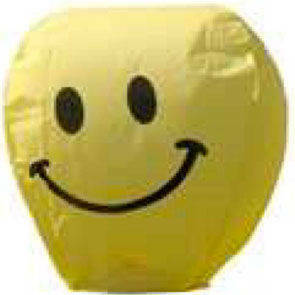 The Wish Lantern, very effective and suitable for every occasion. Using it is easy to just turn on the lamp base and free in heaven. Measurement of the lantern 42"X24". 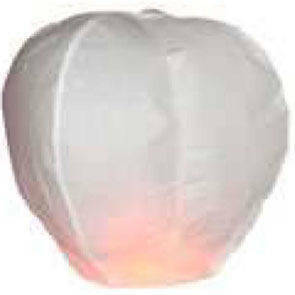 MAXI WHITE LANTERN WISH 52"X32"
Wish Lantern white maxi. Size 52"X32"
I LOVE YOU MEASURE LANTERN 42"X24"
Wish Lantern White with red print "" I Love You ""
Wish Lantern Smile yellow with black print. measuring 42"X24"
HAPPY BIRTHDAY BRACKET SIZE 42"X24"
Wish Lantern with white print "" Happy Birthday "" measuring 42"X24".